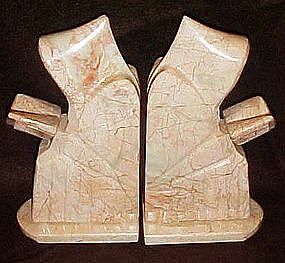 These onyx bookends are the most amazing pink/cream marble color, Sticker says Onyx Tellez Tecali Puebla Mexico. Each bookend is a seated Monk reading a book. Each measures 8" tall and is in beautiful condition. Felt on the botoms. Sold as a pair.